A massive increase in spending and taxes: "Labour has spent four trillion pounds over the last nine years. Spending in real terms will, by 2008, have risen by 40%. The share of the nation’s income consumed by the state has risen by a staggering 5 percentage points to 42% of GDP... And, of course, taxes have risen dramatically to pay for that spending and are to set to rise still further – making our economy steadily less competitive in a more and more competitive world." Little trend improvement that could justify the spending splurge: George Osborne concedes that things have improved in Britain's schools and hospitals but have they improved in rough proportion to the extra spending? He concludes 'no' and points to the fact that there has been no marked shifts in the already existing trends in performance improvement. Conflicting targets: The Shadow Chancellor blames Labour's targets culture for much of the wastefulness: "A staggering 700 Public Service Agreement targets were imposed by the Chancellor, far too many to be monitored and all too often in conflict with each other. Each target then spawned dozens more micro-targets within departments. But having so many targets is effectively the same as having no targets at all... The Home Office alone has now had over 100 different targets imposed on it by the Treasury. When John Reid says it is “not fit for purpose” it is not clear if the government knows what that purpose should be." No credible monitoring of the targets: "The assessments of whether a target has been met are laughable. The Treasury has apparently “met early” the target of improving the cost-effectiveness of public services, even though public sector productivity has slumped, and is “on course” to increase the productivity of the whole economy, even though whole-economy productivity growth has slumped. It comes as no surprise that the judge in both cases was the Treasury itself. The Home Office is “ahead” of its target for “improvement in the level of public confidence in criminal justice system”. That will be news to the public." Targets have distorted behaviour: "Waiting time targets have led to clinicians processing the easier operations first or moving people and on trolleys from one part of an A&E department to another to avoid missing targets." The increase in public sector employment has largely been administrative: "The state is by far the largest employer in the country – and is getting larger. In 1997 5.2 million people worked for the government; today 5.9 million do. The independent thinktank, Reform, estimates that only a quarter of this total increase has been in frontline service delivery posts - the rest have been additional administrative staff." Gordon Brown is surrendering to public sector unions: "Drawn up by senior members of the government and the public sector unions at Warwick University in July 2004, the [Warwick Agreement] secured the political support of the unions in the run up to the election in return for major concessions. These included an extension of protection for striking workers, funding for a union academy, government support for the EU Agency Workers Directive and – perhaps most significantly – a commitment that the bulk of NHS services would be directly provided." The Tories will not surrender: "The next Conservative Government does not regard the deal done on public sector pensions, for example, as binding. We will focus first on the interests of the users of public services and the taxpayers who pay for them." The central challenge in public service reform: "How do you provide incentives to improve in what is in effect a monopoly?" Funded by the taxpayer but not necessarily run by the public sector: "The British people are very attached to taxpayer funded health care and education that is free at the point of use. So am I. As Nigel Lawson put it: the NHS is the closest thing the British people have to a national religion. But it also means understanding that not every doctor or nurse has to be employed by the government. Labour has set an arbitrary limit of 15% of the amount of NHS care that can be provided by independent providers. I don’t believe that such an arbitrary limit should exist at all." Regulation of public services like the police that cannot be independently provided: "The key to improving performance there is to beef up the independent regulation through, for example, elected police authorities." There must be consequences for failure-to-deliver: "You have to expose people to consequences of failure and the rewards of success. That does not happen enough in the public sector... No one is held accountable because no one cares. The Minister has probably moved to another department. The civil servants are thinking about the next announcement." The role of the Treasury: "The Treasury should focus on its primary responsibility of exercising a tight rein on public expenditure. It will need to do that if we are to achieve our goal of sharing the proceeds of growth so that the share of national income consumed by government falls over an economic cycle." ""We will share the proceeds of growth between increased spending on public services and a reduction in taxation and borrowing."" Public services need proper management before any budgets are increased. Mr Osborne may yet come to regret this much-repeated policy commitment. Having read the remainder of the speech, there were one or two flashes of economic understanding lost in the gloom of the sort of consenual economics that held sway pre-Thatcher. Little of inspirational value. Pity, radical thought is so badly needed to refute Brown's absurd economic morality. George has a major job to do. If he can penetrate the Dour One's Armour, we have a much better chance of a real contest for Labour leader. Even if Brown wins a big battle, he will be damaged goods. A phrase from the late sixties is very much in need of revival in this context (and others): “the ratchet effect of socialism.” In other words, the process whereby the increased tax take and freedom erosion inflicted by left of centre governments is barely addressed by their right of centre successors. Let’s face it, these might not be times of heavy direct taxation and nationalisation, but the regime of stealth tax, burdensome regulation and the central target culture has the same objective. If it looks like a duck, waddles like a duck and quacks, it’s hardly likely to be a swan in disguise. As John says, pity about the mantra. A firm commitment to dismantle and reverse the socialist ratchet would be far more welcome. More than that, David, what about Mr Osborne's once-professed interest in the Flat Tax? I find it surprising that one so young could fall in so quickly with today's Browneque economics, the economics of the 70s Scottish Student Union's socialism. He's supremely photogenic, but is there any more to him than that? Not to judge by the paucity of thinking indicated by today's speech. 1) increasing spending massively leads to some improvements in services (but without good value for money). 2) improving how money is spent improves services at less cost (which is good value for money). 3) Labour have increased the spending, we will get the value out of it without increasing taxes further, and hopefully cutting them when we get the fruits of those improvements t othe running of public services. The easy bit is criticising the government, which he has done very well. The much harder bit is setting out convincing alternatives. What we must do is set out our vision in plenty of time and be consistent. If we're not in favour of reducing tax, then what are we for? Simple? A little too so. I think Labour's spending conceals hidden liabilities on a far greater scale than it will ever yield in benefits. 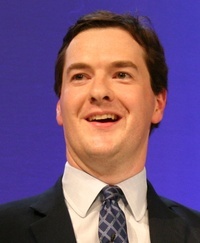 "The next Conservative Government does not regard the deal done on public sector pensions, for example, as binding. We will focus first on the interests of the users of public services and the taxpayers who pay for them." "You have to expose people to consequences of failure and the rewards of success. That does not happen enough in the public sector... No one is held accountable because no one cares." Too right - in the public sector everyone just moves on to their next promotion. When I hear that the Customs and Excise accounts have been qualified four years in a row, I care and I want to see some accountability. unfortunately the pay and benefits system does not seem to differentiate between the two categories. Deborah - Not sure it is good politics to tell all public service workers that their pensions will be cut. People whose pensions or whose partners pension are likely to be cut have a tendency to vote against you. PLP - a difficult one, I agree, but the status quo is not a practical option. "Not sure it is good politics to tell all public service workers that their pensions will be cut." I disagree. Most of the private sector is jealous of the security and certainty in the public sector, and justifiably so since their certainty costs ours. Politically we have to act while the private sector still has the majority. Has a list of Gordon's failures (and failings - including disloyalty to his own boss) been compiled, so that George Osborne and DC have plenty of ammunition as and when they need it? My employers messed up today. Not only was it a busy news day but the grid planner managed to produce an announcement clash. This George Osborne speech on public sector waste AND Christopher Grayling's railways announcement. Not clever. I dont think this is what this site means by the AND theory!!! I suggest more emphasis on the Warwick Pact, attacking not the public sector workers but the public sector UNIONS. As a hat-tip to RichardnJudy, perhaps "They Say - You Pay". personally I'd say we were foolish to announce anything yesterday, the news cycle is being dominated with the Lebanon story. If anything yesterday was a trash day. As for employing the "AND theory" I'd like to see it being used in policy launches, so that the traditional policy would be announced alongside the nice fluffy policy, as opposed to them being weeks apart. It help stop the current pattern of newspaper headlines, where you see "Cameron swings firmly to the right on X" and then a week later "Cameron is a sissy leftie on X". This speech is perfect. Anything too radical -- too swingeing -- will result in negative headlines even from the Telegraph and Mail/Express. This is the right, considered first step towards damaging Labour's media-given record on tax and spend. Thank you David Cooper, I shall use “the ratchet effect of socialism” a lot. I posted here the other day asking about people's views on Osborne; I personally think he has been poor as Shadow Chancellor. Without being too petty and churlish, he seems to lack the intellectual presence to take on a substantive role such as Shadow Chancellor. This has been shown by his media appearances and appearances in the House of Commons, one would also argue his impact in the City of London has been somewhat lacklustre. Perhaps Osborne would have been suited to the role of Shadow Chief Secretary to the Treasury or Shadow Trade and Industry Secretary. It's often baffled me why the Tories have not made more of the fact that Labour inherited such favourable economic conditions from Ken Clarke in 1997. Would the Tory rank and file accept Clarke as Shadow Chancellor? Never likely to happen given the relationship between Cameron and Osborne, and Clarke's recent outbursts. It's interesting that Osborne attacked the Warwick agreement and the public sector pension deal. Does this square with Cameron's desire to address the TUC Conference in the near future? Does this square with Cameron's warm words for civil servants and public sector workers? Turning to the speech, it gives a wonderful analysis of what Gordon Brown and the Treasury has done since 1997 which would not look out of place in the a low-market A Level Economics Journal. But there is very little on what actually an Osborne Treasury would do. It's rather similar to the Cameron hoodie speech that gave a film review and an analysis of charity's but little in the way of proposals. I guess you will all shoot back that there are policy groups to develop concrete proposals. I read this speech last night and I wasnt very happy anyway having read through some of Camerons Chamberlain lecture (Ive never been so angry with a speech). This speech didnt calm me down. I felt unfulfilled about it. Its vacuous. The Treasury has more power than ever. We need a big hitter who has the ability to really get a grasp of the vast empire and get right in. The speech above is empty. For the love of all things holy, Tory leadership, quit the one liners. Politics is for serious people. The "swapped prudence for promiscuity" line is unnecessary. Quit the comedy...please.